Dual Channel Photodiode Amplifier versatile, multi- configurable amplification of currents from pA range up to µA range. The Multiboard allows simple and stable amplification of our photodiodes or any other active optical components. The Multiboard allows simple and stable amplification of our photodiodes or any other active optical components. In most applications of optoelectronic photodiodes, such as the TW30-series, only very small photocurrents are generated. These currents, ranging from a microampere down to some picoamperes, cannot be measured by commonly available multimeters – an amplifier is needed. 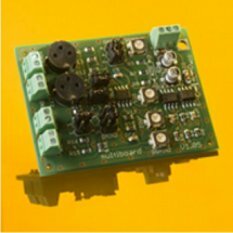 We supply this small multifunctional amplifier board for developers in order to simplify and support application development. Note: The board is shipped without any photodiodes. The Multiboard consists of two independant amplifier channels with adjustable gain. By using jumpers one can select the amplifier type (voltage or transimpedance amplifier) and configuration (two independant amplifiers or single two-stage amplifier) as well as the gain. The board provides current gain in the range 105 V/A to 107 V/A and voltage gain from 2 to 1000 V/V in single-stage configuration. Additionally to the fixed gain factors are potentiometers for custom gain factors in the range 104 to 106 V/A. By two stages one may reach current and voltage gains of 1010 V/A and 105 V/V respectively, if offsets are carefully adjusted. The maximum usable output voltage range is +/-4 V and this must be considered while calculating gain factors. The circuit is ideally operated with a dual power supply of +/-9 V to +/-24 V. For lower performance measurements a single supply of 24 V to 36 V may be used. In both cases stabilisation is not required. The photodiodes plug directly into sockets or are externally connected via screw terminals. The output voltages are available at screw terminals. The boards dimensions are 45 mm x 60 mm and the height is about 12 mm without photodiodes.